I’ll cut to the chase here, since it’s already been seeded by my other creative partner (my wife, Rhiannon) over on her blog post for Feather & Fox’s big move when she teased the idea of a merger. 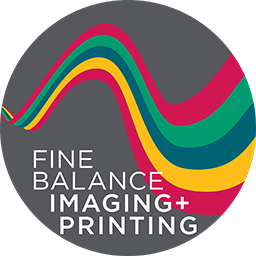 Fine Balance Imaging and Whidbey Island Printing are merging to become one: Fine Balance Imaging & Printing. And we’re taking Feather & Fox with us. And we’re moving back to Langley. It’s where Fine Balance began as a collaboration with local artists a little over ten years ago. A couple months ago, I had a meeting over coffee (at the lovely Flower House Cafe) with Sharon Rose. She’s the owner of Whidbey Island Printing (formerly known as Boomerang). For a time, we had been taking on small banner jobs for her here and there. Her large-format printer needed repairs, and as we know all too well, fixing a large format printer that refuses to print is often more effort and expense than it’s worth. But small businesses, no matter how successful, don’t always have the extra $6,000-$10,000 to throw at a new machine just because it decides to be temperamental. It started with a phone call about a banner job. Then a discussion about how complimentary our businesses were. How we were both doing. And how we could grow. And what might come next. What we both thought might be a brief meeting over coffee turned into an almost two-hour discussion. What collaboration might we both benefit from that would most benefit our clients? How could we co-create a better future for both businesses, and offer the community the absolute best services and products across the entire spectrum of production printing, graphic design, copying, layout, consulting, fine art and photographic printing, and more? What would it look like if there was a center for small businesses in Langley that handled it all – without sacrificing quality or efficiency? Without losing the personal touch our combined clientele have come to know and respect us for? After two months of negotiations, we’re excited to share our news: the consolidation of our resources and expertise, creating a merger of our companies into Fine Balance Imaging & Printing. Creative Community Collaborations happen here. Quite naturally, in fact. Perhaps it is part of the nature of our business to imbue a co-creative and collaborative spirit in the efforts we’ve made with our clients, customers and the greater community of South Whidbey Island. Sure, some projects are more simply: input, output, done. But more often than not, a project becomes a merger of the minds, a collaboration between our capabilities at Fine Balance Imaging Studios and our clients – be they artists, photographers, small business owners, large business owners, non-profit organizations. A conversation begins with a consultation, or maybe over coffee. And then inspiration strikes, we get excited, we discuss the endless possibilities that come cascading through our imagination, and the outcome is a collaborative effort. It’s not just a client paying us to design something for them. Or to simply print out what they give us. We work together toward a common goal of co-creating the best outcome we can arrive at through our collaboration. So it goes that a brief meeting over coffee with another business owner turned into a collaboration, a vision for a resurgence of two small businesses that together could bring about greater impact in the business core of the south end of Whidbey Island. Stay tuned for news about…the move!